Analogue synth know-alls have been championing Studio Electronics for years. The US company was founded in 1981 by Val St. Regis and Tim Caswell. 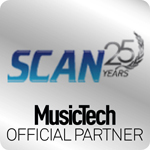 Over the next decade it went from being a specialist at retrofitting analogue machines to experts in analogue synths themselves. Indeed, while the rest of the world went digital – how we laugh at the rest of the world’s foolishness now – SE released the first analogue synth for years, the Moog-like SE-1. Since then, analogue (or analog, as we’re talking American here) has become the company’s ‘thing’. The SE-1 is now the SE1-X (new features and operating system) with limited edition SE1s in the form of the fantastic-looking Red Eye and Angel Dust. Studio Electronics has also released poly synths called the omega8 and C.O.D.E and we’ll get them in in a few issues time just to lust over them, pretending they’re new releases. In fact, the terms ‘old’ and ‘new’ just don’t count when you’re dealing with SE. Here’s a company that went analogue when everyone else went digital. What does it matter when the stuff comes out, came out, and will come out?! And so we come to Boomstar. 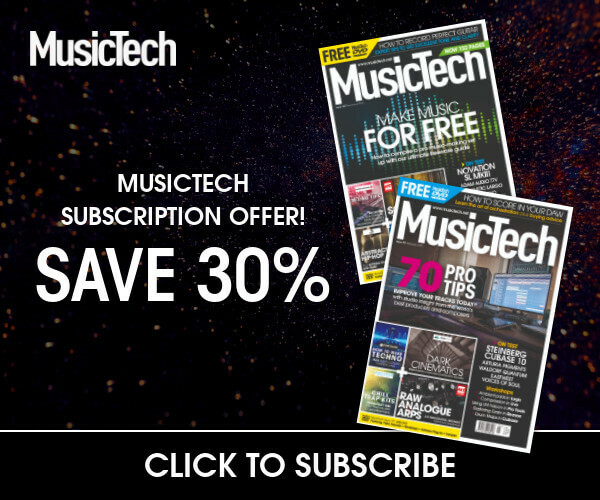 It’s a series of analogue mono synths that seems to have been around – maybe just in my mind – for a while but, actually, its two most recent models were only announced at this year’s NAMM show. 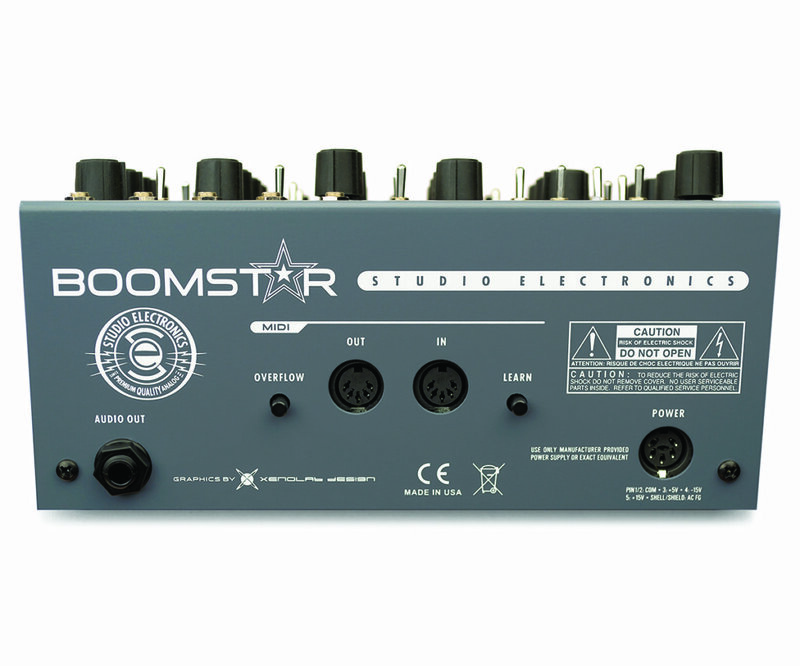 And the Boomstar concept is certainly an idea you can’t argue with. Take a fairly standard analogue model of a synth with two oscillators, two envelopes, LFO and a stack of rotaries, CV inputs and standard outputs, add MIDI and then a different colour (sorry color) and a different filter for each model, and you have a range of synths! 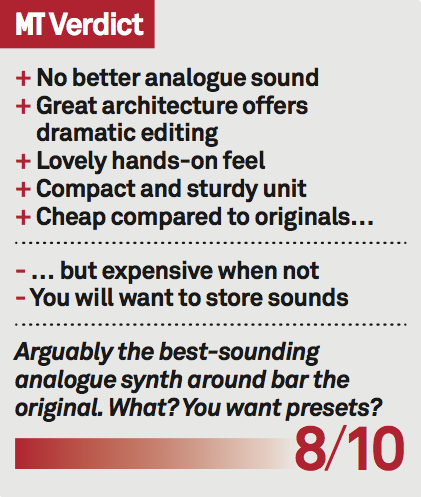 Boom!But the ‘Star’ of the show – see what I did there – is that each filter is based on a classic synth, so for £800 a pop (not cheap, on the face of it, but we’ll come to that), you get a classic synth in new form. OK that ‘form’ is boxy and practical but put all six models together in a line in your studio and even the most hardened digital fan would surely go weak – in a very cyclical, smooth and sine-based way – at the knees. 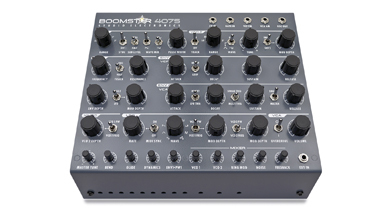 So to the unit on test – the Boomstar 4075 with a filter based on the ARP 2600. 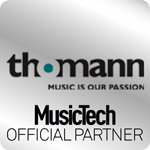 Others in the range are the SE80 (with a multi-mode filter based on the Yamaha CS80); the 700 (based on a MiniKorg); the SEM (Oberheim); 5089 (24dB ladder from the Moog); and the 3003 with characteristics of the ubiquitous Roland TB-303. With so much acid action in the pages of MusicTech recently I’m actually quite pleased not to have the last one on the list – that’s for another day – but as an ARP fan, the 4075 will hopefully be a pleasure. A quick final word on the concept, though. Is it a true emulation of the original? Ok, so looking at the ‘Boomstar foundation’ – the standard set of controls for each synth in the range – after the Oscillator Range dial we have stackable waveform oscillators, already a nifty concept in that you can mix triangle or saw waveforms, or sine or square using the simple Wave Mix knob. There’s a Sub Level switch that can be selected at either a full or half octave square wave down plus a Pulse Width dial that controls the square wave. 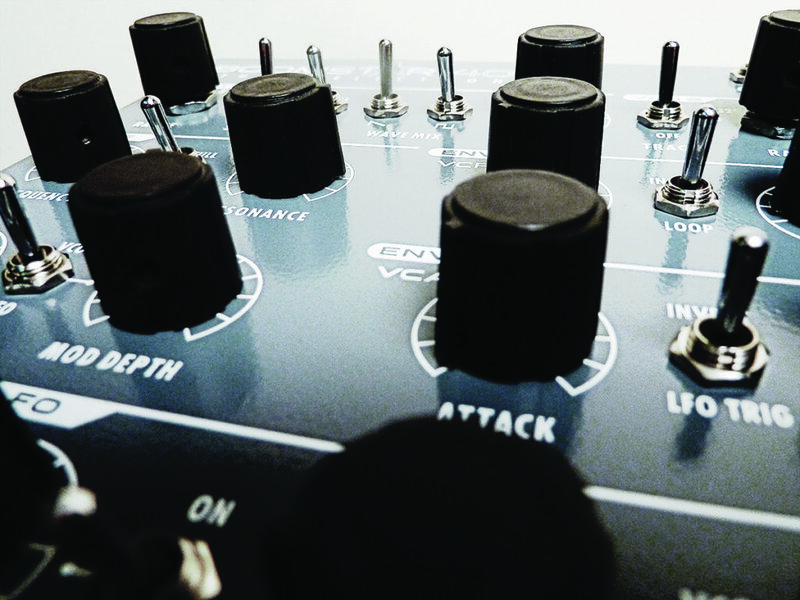 Oscillator 2 can be sync’d to 1 or variably tracked. The waveform here is switched between sawtooth or square/triangle and the frequency of the oscillator can be set to be modulated by either envelope with a final dial for Depth to determine the amount. Moving down, we’ve touched on the filter section (each has its own unique ‘classic’ model fitted). You then get the ADSR stages for the envelopes to control – as detailed above these can be applied to OSC2. You can control the timbre by altering the filter cutoff frequency using Envelope 1 and the volume characteristics using Envelope 2 – usefully both of these shapes are invertible so apply the opposite characteristics to the waveform. You can also select the Envelope and Modulation Depths of either as they apply to the frequency with rotaries beneath the filter stage, the latter of which also applies to the LFO. The X-Mod dial is interesting in that it can set the amount of the second oscillator’s frequency modulation as applied to Oscillator 1’s frequency or pulse width thus creating a lot of movement on the latter and turning this oscillator into a kind of LFO with low frequency settings. More movement comes from the actual LFO (switched into action in the Depth section above) – the modulation section of the synth which can help add repetitive cycles of pitch and rhythm to your tones. This is where the machine really comes alive in terms of drama as you can easily set rates and waveform types (they blend rather than act as discreet shapes) and it gets interesting the more random these shapes are. The Mod Depth dials, like the X-Mod dial, can be switched between both oscillators’ Pulse Width and Frequencies, the latter of which offers the most drama. The final act – if we are to stretch the play analogy further – is with the bottom rotaries which apply to global features like Master Tune and Bend plus a mixer section. Here, with a bit of tweaking, you can learn what actions you have made on that second oscillator, simply by mixing it in and out. This is a lesson in analog(ue) synthesis if nothing else. You easily hear and learn which envelopes can be applied where and what a dramatic effect the LFO can have pretty much everywhere. The sound is much harder to define and sum up as one sweep of the LFO Rate and Wave dials can easily have your sound instantly veering from a screeching rhythm to a warm glide. In fact if you are approaching this beast as a user of soft synths or as an expert in desktop music production, be prepared to change your mind set. This isn’t about stepping through presets and choosing which ones will be used in your song, it’s about sitting down and creating, and coming up with sounds that are, very often, amazing (and I admit it, often by accident). But learning which dial impacts the sound and how it all works together will soon have you on your way to creating sounds with depth, character and dirt that you will only dream of in a digital environment. Along the way you will create some glorious sonic experiences. From slightly detuned oscillator rasping where one’s chugging gently beneath a more mellow, natural synth lead to some booming bass monsters. There will be rhythmic pulsing, random dancing, resonating high frequencies and more, yes more, pulsing. 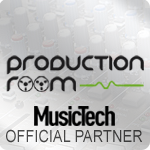 You will want to record your results so a good old-fashioned analogue out to DAW in might be a good option – and I suggest DAW in ‘constant record’ mode just in case you miss something. Previous articleA Nine-Foot Tall TR-909 anyone?